Have you ever thought about having fun while also serving the environment? It can be done with little fanfare and effort during a trip to Merrill Creek Reservoir and Environmental Preserve in Warren County. Visitors have the chance to help in environmental studies by merely carrying a turtle or lending a fish on the end of your hook. Merrill Creek Reservoir can be used during daylight hours by licensed boaters whose conventional boats and canoes are at least 12 feet long, with electric motors only. Smaller kayaks and inflatables may be used too, but with extreme caution. Neither swimming nor camping is allowed, but the fishing is great with a huge population of trout. Many of the lake trout having already grown to their legal size limit of 24 inches. Brown and Rainbow trout live here as well as large and small mouth bass. 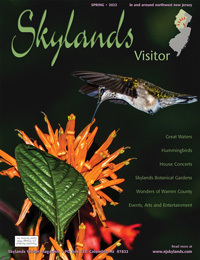 The Visitors Center offers interactive kiosks, nature displays, historical exhibits, and a regular program of nature walks and workshops presented all year. There is no charge to visit Merrill Creek Reservoir and Environmental Preserve. Of course, your main reason for visiting would be to enjoy the exceptional outdoor resources and breathtaking panoramas from the top of Montana Mountain, high above Route 57 in Harmony Township. 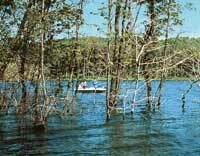 For those unfamiliar with Merrill Creek, the 650-acre reservoir was constructed to store water for release to the Delaware River during periods of low flow. Since it opened in May of 1989 the area has become a popular destination for outdoor lovers. Some 2,000 acres of forests and fields provide the opportunity for nature study and hiking, while the lake, with more than five miles of shoreline, lends itself to fishing and boating. There are fascinating nature displays within a Visitor's Center that features auditorium facilities, exhibits and computerized teachings and games, one of which offers you the chance to build your own bird! Yet, Merrill Creek is more than just another pretty face on the map; and more than just a trough that quenches the Delaware's thirst. Thanks to the efforts of naturalists Jane Bullis and James Mershon, it is a leading activist in environmental management, which has become increasingly important as developers continue to shrink our open space. "There's more to Merrill Creek than meets the eye," Bullis says. "Yes, it's a beautiful setting with open space and hiking trails and boaters. But there is functional environmental managing going on behind the scenes. We're looking at it from the standpoint that Merrill Creek is forever preserved. This is open space and a prime area for environmental research to take place, and it's a great research station. "We can aid in the research that's going on in other parts of the country with some of the different species we're working with. Hopefully, the information that's gained from our studies can work in conjunction with other efforts. They can develop environmental management plans on how to best protect areas, especially with open space being such a key issue these days." 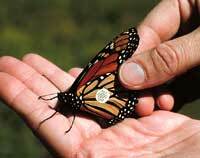 The Environmental Management programs are to sustain and enhance the ecology of the area. Included in the plan are measures to maintain and enhance a variety of wildlife habitats, as well as protect endangered species. The plan has been implemented by the Merrill Creek Owners Group, which consists of seven electric utilities along the Delaware. "Although you don't hear much about environmental friendly utility companies," Bullis says, "these utility companies are a key piece to the whole thing. They are really making this work by allowing us to do these things." One of the programs includes monitoring the growth rate of the fish that are stocked in the reservoir. Each fish is fin-clipped to monitor the tracking. If you decide to cast a line into the reservoir and are lucky enough to bring back a haul, you are then a candidate for what is known as a Creel Census. "When the fishermen come back to the boat ramp, the attendants will take their information," Bullis said. "They log the boats in and out so they know how long the fisherman has been out there, what kind of bait they were using, what fish species they were targeting and what they captured. "We can get an incredible amount of information from one fisherman coming in from the catch they have. To supplement that, the boat attendants will take the stomachs from the fish, put them in a jar and send them to our fishery consultants to analyze in the lab and see what the fish have been feeding on. So, the fishermen are actually part of the research that's going on here." The process is done for the overall health and function of the fisheries that are being developed at Merrill Creek. Since the reservoir's origin was that of an empty bowl that was filled with Delaware River water, and then stocked, the naturalists are trying to make sure the habitat will enable the fish to grow at a sensible rate. Brook trout surveys are also done, as electric shockers pass current through the water. While the fish are temporarily stunned, they are measured and returned to the water in order to chart the growth. Visitors can also help with endangered species, such as the Bog and Wood turtles. If you happen to find a turtle during one of your hikes or nature walks, please report your discovery to the visitor's center, where the naturalists can go to work. "These turtles were found on the property prior to construction," Bullis said. "The Bog turtles had to be researched, we're following them with radio transmitters that we glue to their shells to follow their movements. And with any turtle we find, we also notch them as a way to identify them if we ever capture them again. It's a way of tracking the population." There are some other sights one might stumble upon that might seem strange, but they are all in the name of environmental management. If you see what looks like volleyball nets hanging from trees, they are mist nets designed to capture birds that are coming in to feed or nest. The birds are then banded for life so that naturalists may track their movements. The staff also works in cooperation with the New Jersey Division of Fish and Wildlife to monitor black bear activity at the Preserve. Fur samples are collected and sent to state laboratories who then conduct DNA studies. The projects have been ongoing since the reservoir opened, and have become a source of pride for Bullis and Mershon. "In many settings, environmental management would not be looked at as a high priority," Bullis said. "But Jim and I both feel this is where our priorities are at and we want to be involved with as many different applications as we can." And in some instances, visitors can be involved as well. Photos courtesy Merrill Creek Reservoir and Environmental Preserve. For more information please call 908-454-1213 or visit their website.